Stalk these 13 Chicago party haunts and spine-chilling events this Halloween season. Halloween in Chicago is about so much more than booze cruises and pub crawls — although who doesn&apos;t love cocktails on the water and bar-hopping with friends? If you&apos;re after something a little different, though, you can pretty much pick your poison: a haunted hotel rooftop party, a pageantry-filled masquerade ball or a hunt for clues through a haunted mansion, to name just a few. Chicago Halloween events in 2018 come in every spooky shape and size. 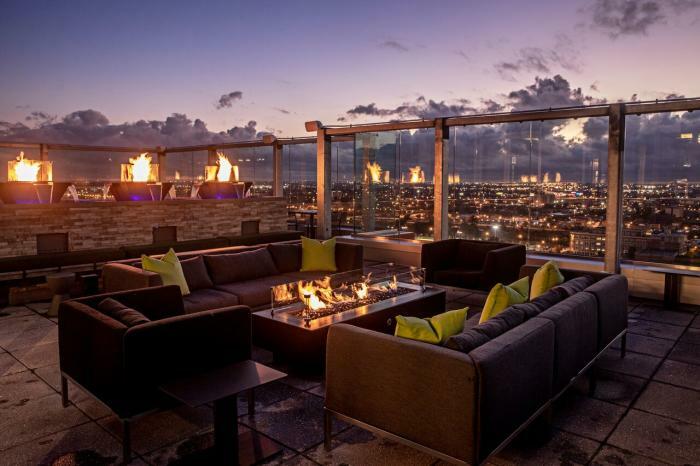 Here&apos;s a roundup of parties and events that are upping the ante on chills and spills this year. October takes on an element of the surreal as dusk falls upon Chicago. 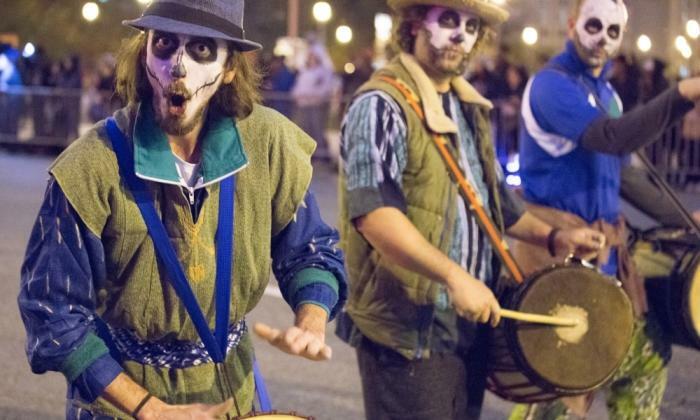 Arts in the Dark brings together artists from around the city for a procession filled with spectacle, puppetry, legions of masked entities, luminous lanterns, and mesmerizing performances. This year’s parade, which takes place on October 20, will be led by eight “Illuminaries” recognized as influencers in their respective fields. World-renowned institutions, including the likes of the Art Institute of Chicago and Lookingglass Theatre Company, get involved each year. 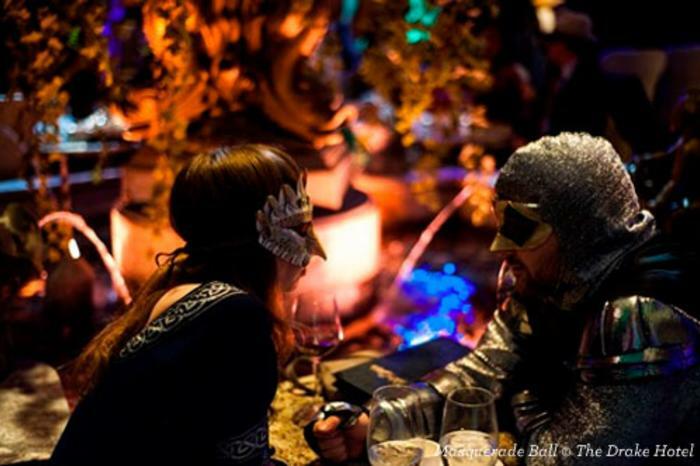 Chicago Athletic Association hotel invites guests to dance the night away, as if it were the last night on earth, at its fourth annual Halloween event – Underworld’s Fair. The World’s Fair of 1893 put Chicago on the map and 125 years later it’s the first to disappear into the ether. Celebrate Halloween as if it were a dystopian state by seeking shelter in the building’s Stagg Court, accompanied by hundreds gathered to dance into the dust to the sounds of iconic house music including local legend DJ Pierre, presented by Empty Bottle. Roam 20 hotel rooms on the haunted 5th floor of the Godfrey Hotel Chicago as you ascend to a lair of revelry at the IO Godfrey rooftop party. It&apos;s not like you&apos;ll be able to sleep anyway! General admission tickets are $25 (with cash bar), while group and VIP experiences of every kind are available at various price points. The stunning Palm Court at the historic Drake hotel is the setting of a Chicago tradition: a luxurious masquerade ball, filled with history and mystery. Live entertainment by the Flat Cats, masques and black tie attire add to the ambiance of extravagance. Seating will be available in the Palm Court and Club International rooms on a first-come, first-serve basis. Squirm in your seats as actors from Lifeline Theatre present staged readings of Poe&apos;s terrifying stories and poetry. 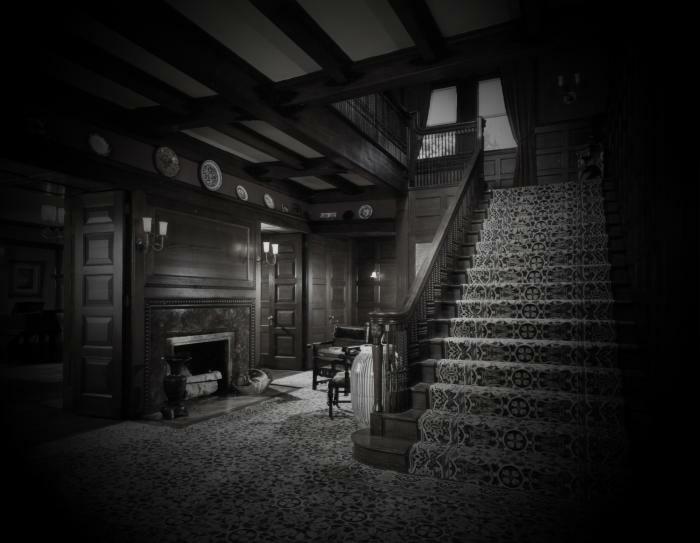 This has been a Glessner House tradition for the past three decades, and its an evening of Gothic literature not to be missed. 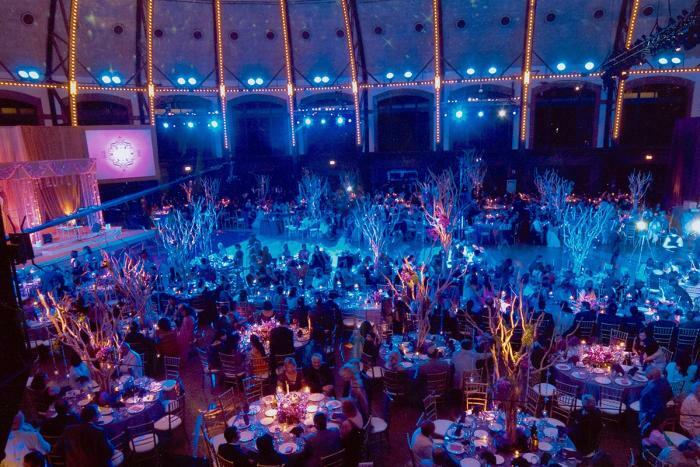 The stunning Aon Grand Ballroom is a sumptuous backdrop for your Halloween celebrations, commanding views over Lake Michigan and the Chicago skyline. Revel under the Grand Ballroom’s 80-foot domed ceiling as you dance to the beats of top live DJs and sip at the fully stocked cash bar. Treat rather than trick yourself with a VIP ticket add-on for access to the ballroom&apos;s balcony. Pick the brains of dead poets as Life Force Arts Center summons the spirits of literary giants to its annual Dead Poets Halloween Party. By the way, Frankenstein author Mary Shelley will be hosting! Come dressed as your favorite dead poet and compete for the best costume prize. Or take part in an Open Mic session, reciting your favorite poet’s rhapsodic words or sharing your own spooky sonnets. Nibble on delicious bites, sip libations, indulge in Tarot and other oracle readings, and browse haunting Halloween jewelry, masks and artwork while you&apos;re there. 1811 S. Blue Island Ave. 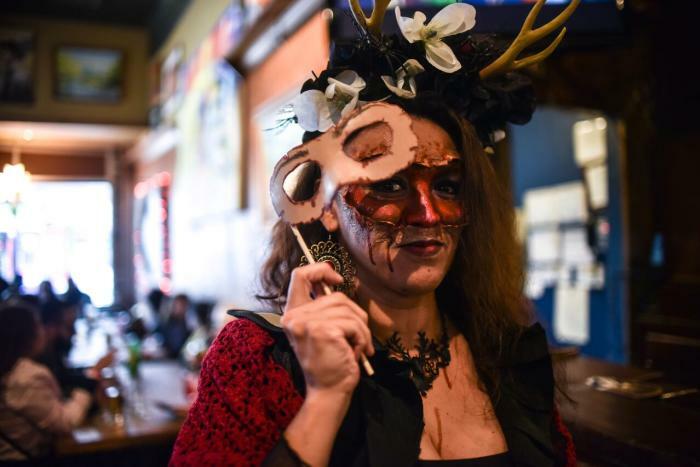 The Brew-Ja Crawl returns for a Day of the Dead-inspired tour of Pilsen&apos;s exciting food and music scene. Wear your most creative costume and hop on and off the trolley at 14 different bars and restaurants throughout the neighborhood. Your ticket will also get you tastes and sips at many of the stops, including a craft beer or cocktail, food and drink specials and more. Light, projection and visual displays will transform the National Museum of Mexican Art’s exterior and the surrounding area for this annual Day of the Dead celebration in Pilsen. What&apos;s more, in Harrison Park, visitors will create their own ofrendas (Day of the Dead altars), transforming the soccer field into a festive community gathering place, just like those you would see in Mexico on Día de los Muertos. 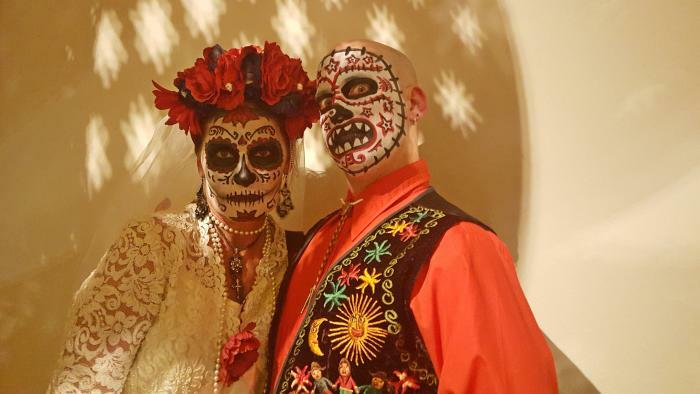 Pan de Muerto (Day of the Dead Bread), altar demonstrations, live musical performances, face painting, and art activities will round out the evening. Throughout the year, the Chicago History Museum hosts History Happy Hours, where guests enjoy two drinks on the Museum, tours, talks and activities highlighting the collection and its special exhibits. For the Halloween season, the Museum has something special in mind: a Halloween Happy Hour that delves into Chicago&apos;s haunted, creepy, scary history! Costumes, of course, are encouraged. General admission on Tuesday evenings is free for Illinois residents. Tickets for the happy hour are $15 per person, which includes two complimentary drinks, tours, and museum admission. 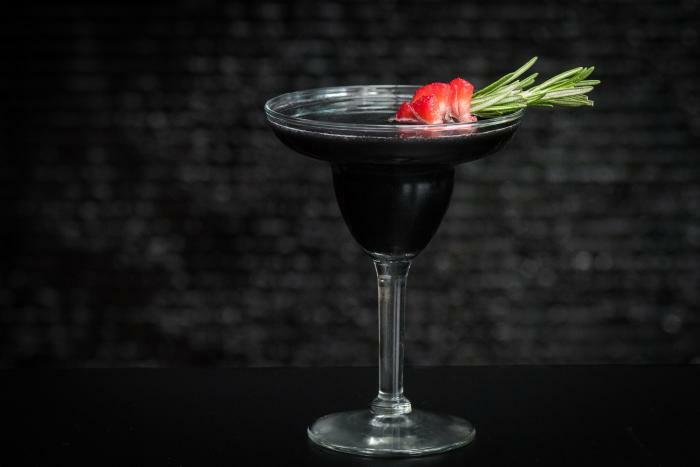 Celebrate the Day of the Dead at the South Loop&apos;s only rooftop bar. Costumes are encouraged at this Halloween night celebration, which will feature a live DJ, food and drink specials, festive decor and complimentary tequila samples. There will also be raffle drawings and prizes throughout the night. 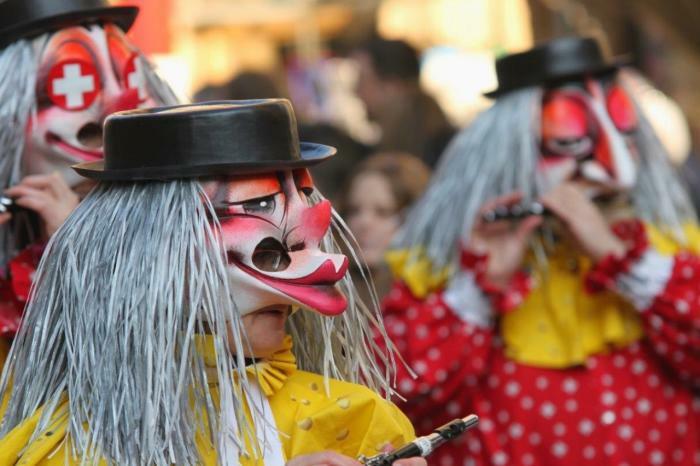 The Northalsted Halloween Parade is ranked one of the 10 Best Halloweens in the US by Fodor’s Travel Guide. At this annual event, an exuberant crowd lines the streets of Boystown, one of the nation&apos;s leading LGBTQ+ communities, to check out fantastical outfits during an evening parade. A costume contest judged by a panel of drag queens, and Halloween food and drink specials at restaurants and bars along Halted Street, are only a few of the parade highlights. Honor life and the spirits of los muertos at this spectacular post-Halloween event, with live music, delicious bites, beer and cocktails, and a chance to win a whole slew of prizes. It&apos;s all in support of the National Museum of Mexican Art, which ensures that admission to its hallowed halls remains free to the public throughout the year.